This is the basement right before we moved everything and tore the carpet out. This the the basement now, ready for beautiful flooring and fresh coats of paint on the wall! Cody finally had a day to work on the basement. Like most DIY projects, the preparation takes a lot of time. I was not a lot of help since I was sick, but I was able to be with the girls so he could have some uninterrupted time to work. First, he grinded all the nails from the past carpet installation level with the concrete. That was a smelly and messy job and it took awhile to get the burnt metal smell and metal particles out of the room. Second, he vacuumed and cleaned the floor of any debris. This didn’t take long, but then we needed to make a decision about the cracks in the concrete. At this point Cody went to get sealant for the cracks so that there won’t be any moisture under the vinyl flooring that we bought. We used Quikrete Polyurethane sealant self-leveling. The sealant has dried and looks fine. We are glad we took the time to do that. This is the flooring we ended up getting at The Home Depot. It is lighter than I originally wanted, but since I have seen it on the floor in the basement, I am very pleased with how it looks. Since there is not a lot of natural light in the basement, this flooring will help brighten the space, along with the white paint. 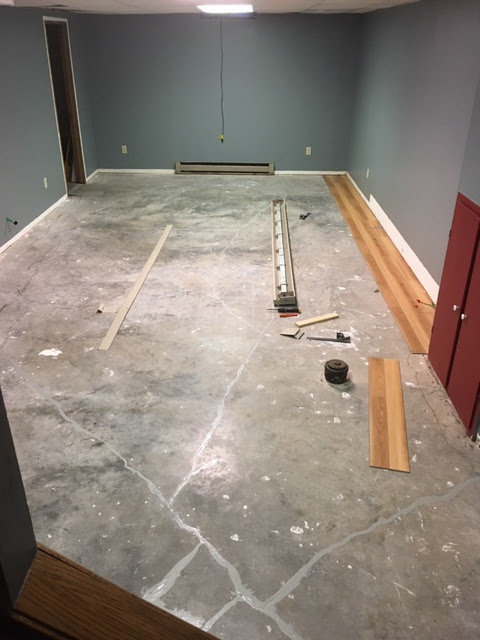 Once we are done installing the floors, I will post a pictures for you to see. Once the flooring is installed, I will paint the walls. The next step will be to plan the toy storage and start working on the wall art that I want. My goal is to have a space where the kids have a play area and I have a place for me to feel at home while I am down in the basement playing with little ones, folding laundry or visiting with friends. I am very excited about the space and it has been hard to be patient about the slow process, but it will be worth it in the end. The next phase of the project is actually laying down the flooring, painting the walls and then putting new baseboards in. If you paint before you install the flooring you won't have to worry about and spills.